So you are off caravanning and you are going to stay at a site that does not have mains Electrical Hook Up (EHU) and you need to run a mains powered device…. what options are there? Well you can buy an inverter that converts 12 volts DC (Direct Current) from your leisure battery to 240 volts AC (Alternating Current) , the same as the sockets in your house. But there are some drawbacks, but before we look at that, you need to know a little more about how inverters work. So how can an inverter create hi-voltage AC from low voltage DC? Ok, lets first look at how you generate electricity. All we need to generate electricity is a coil of wire and a spinning magnet (or a spinning coil of wire and a fixed magnet works just as well) If you look at “Drawing 1” below you can see the schematic of how a rotating magnet induces a current in a coil as the magnetic poles pass the coil. Each time a pole passes the coil a small electric current is produced. As the pole passes and the next pole lines up to pass, the magnetic field is reversed and the current starts to flow in the opposite direction. 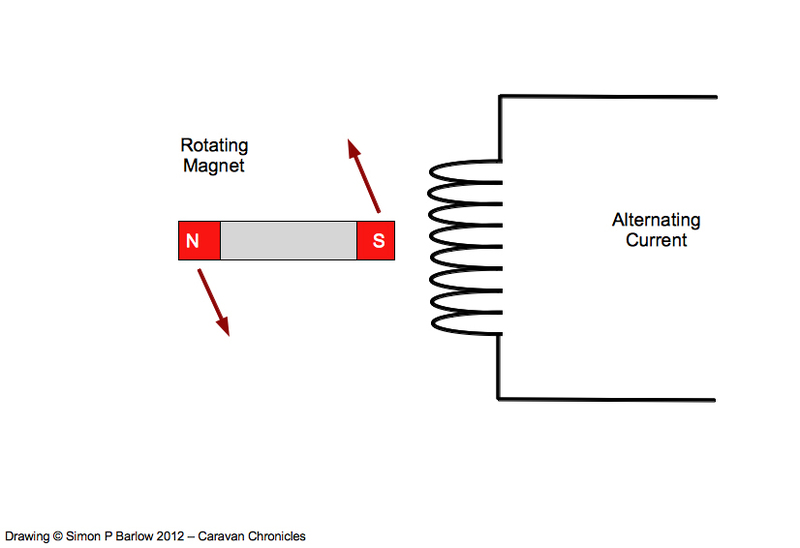 Rotate the magnet fast enough and an alternating current is produced. is generated, as the north pole gets nearer, the magnetic field gets stronger, increasing the amount of current generated as the magnetic pole is directly opposite or 90 degrees to the coil, the largest current is generated. We can see in Drawing 2 the relationship between the angle and the current generated. The blue line is the classic sine wave shape. So how can we recreate this? Well, we could use our 12 volts DC to power a small electric motor, which in turn drives a small alternator and generates the 240 volts AC that we need. This would be very inefficient and very heavy and not really practical. What we can do however is simulate the magnets poles passing across the windings of a coil. So how are we going to do that? Well, again, the answer is simple, but first we need to look at another bit of equipment. You will have heard of transformers…. and I don’t mean the popular films about cars that become spooky robots from the cinema either. Transformers have been used almost since Mr Faraday discovered a few things to do with electricity while he was at the bottom of his garden messing about in his shed. A transformer allows you to increase or decrease an alternating electrical voltage. Some times these are called “Step Up” or “Step Down” transformers depending on if they are increasing the voltage or decreasing the voltage. A transformer is a simple device, it is just two coils of wire interconnected by a soft iron core to conduct the magnetic field. In Drawing 3 above, we can see that the two coils of wire are slightly different. The coil on the left is smaller than the one on the right. In this case, the coil on the left is called the “Primary” and the coil on the right is the “Secondary” so this is a “step up” transformer. Put a small voltage across the Primary windings and you will get a larger voltage out of the Secondary windings. If we have a voltage of 120 volts AC and we need 240 Volts AC to run a 3000 Watt kettle, we first have to do a bit of maths. Now lets look at what we want… to power our kettle we want 3000 Watts at 240 volts so to find the current divide the watts (Power) by the voltage and we get 12.5 amps current. Now lets look at the input, we still need 3000 watts, but this time the voltage is only 120 volts… so 3000 / 120 = 25 Amps. Wow… that’s a lot of current and that means big cables! So you can see, getting a large voltage from a small one using a transformer is easy, but getting the power is a problem. 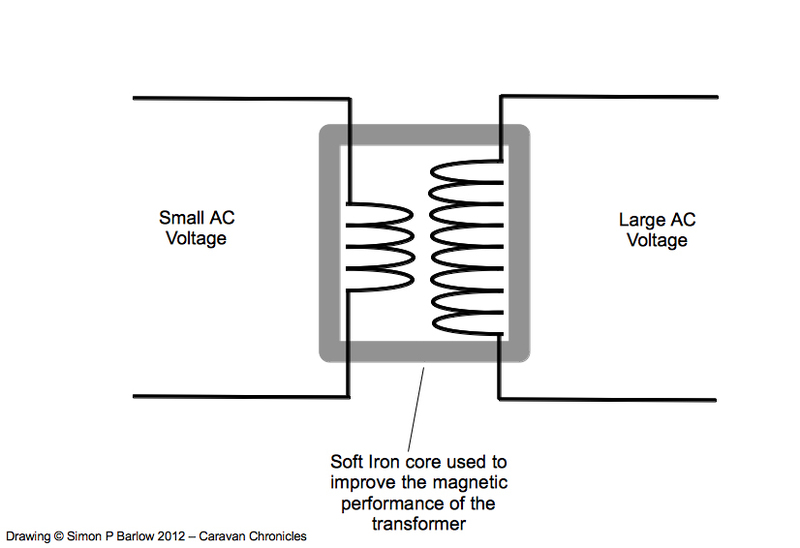 Back to our inverter… now we know how a transformer works, how does that fit in with our inverter? Well, way back we said we needed to reproduce what the spinning magnet did in the generator… this time without the spinning magnet, I think you are ahead of me now… stick with me though. 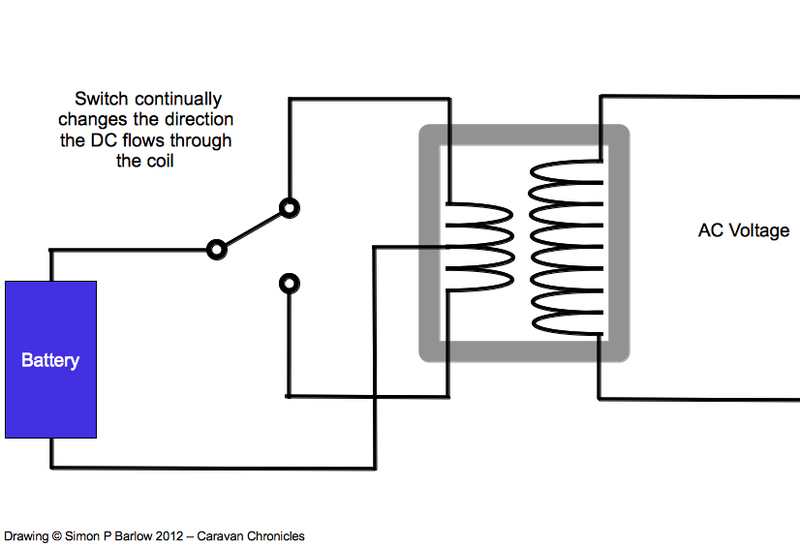 If you look at Drawing 4, what we are actually doing is switching the battery, first one way across the primary coil of the transformer, then switching it the other way… so in effect alternating which way the current flows through the primary coil. Fantastic… if you can flip that switch 50 times a second, we have this problem licked and will make a fortune! Hang on, there is a problem.. flicking that switch 50 times a second is going to get tiring really quick, there must be another way of doing it? Well your wristwatch probably does it. A simple electronic circuit to flick that “virtual” switch 50 times a second. Great we have it cracked! Hmm… remember a bit back… the universe… balance? Well, lets look at the maths. We still want to boil our 3Kw (3000 watts) kettle and it still works at 240 volts and it still needs 12.5 Amps. This time however, we only have a 12 volt battery to deliver the 3000 watts of power. So, getting the calculator out again 3000 Watts / 12 volts = 250 Amps… That is one big set of cables we need to connect that battery! 90% of inverters on the market are built like this. They are usually built to a price and are usually between 80 and 90% efficient. They usually have built-in some sort of low battery voltage protection and thermal protection. But more usually you will find that they are limited to just a few hundred watts and can only run small electrical devices. There is however another problem. The fact that the battery is just switched one way then another gives a very jagged output and some sensitive electronic equipment can be damaged by this. In order to try to mitigate this, some inverters have what is called a “Modified Sine-wave” output. All these inverters do is step up and down the voltage as it is being switched… so as the switch changes, a voltage is applied, then stepped up a bit, then a bit more, then down again, and down lower than the switch flips over and the cycle is repeated. 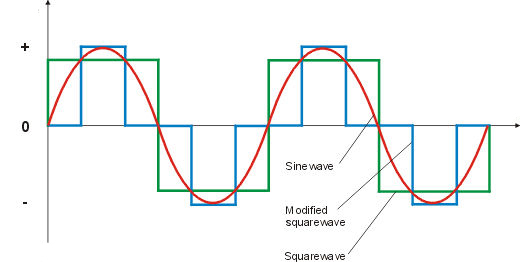 In Drawing 5, you can see the red line is the pure Sine wave, the green line is a square wave which is easy to create electronically and the blue line is a modified square wave to make it more like a sine wave. So what is wrong with this? Well transformers are complicated little things on the quiet… it seems simple at first just to have two coils of wire wrapped round an iron core, but in reality there is more going on with the magnetic side. It takes energy to build a magnetic field, energy is transferred when the magnetic field collapses, then more energy is used to change the polarity of the field and rebuild it. Magnetic fields have their own behavior, and when designing a transformer, you have to also take into account the magnetic performance and what the Hysteresis Loop looks like. A smooth transition rather than an abrupt step is more efficient. All that is getting way to deep for a bit of light reading though! How can we improve this? Well, we can use a little circuit called an oscillator. 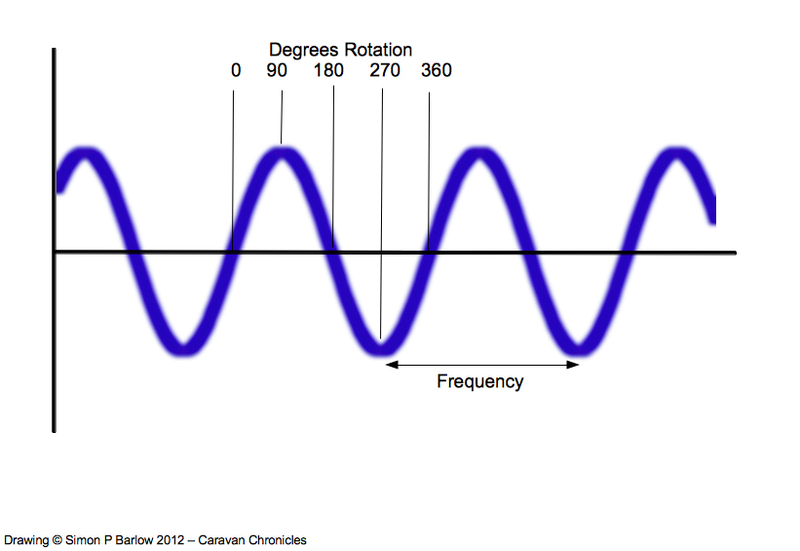 You have heard the howl or feedback when someone puts a microphone too close to a loud-speaker… well that is oscillation and we can use a simple circuit to create a sine wave output. Now comes the tricky part… you can’t realistically build an oscillator circuit that could handle the currents involved in an inverter, but you can build amplifiers that can. Think of your local pop concert, the PA system can be rated in Kilowatts! So we can use a power amplifier to give the oscillator enough output to feed a transformer. If we look at Drawing 6, we can see how these components come together. It looks like now we have the makings of a really good inverter. Add some protection from over-load, a warning system for low battery voltage, a fan to keep the components cool and a beeper to warn if it’s overheating. Pure Sine Wave inverters are three to four times the cost of modified sine wave inverters. 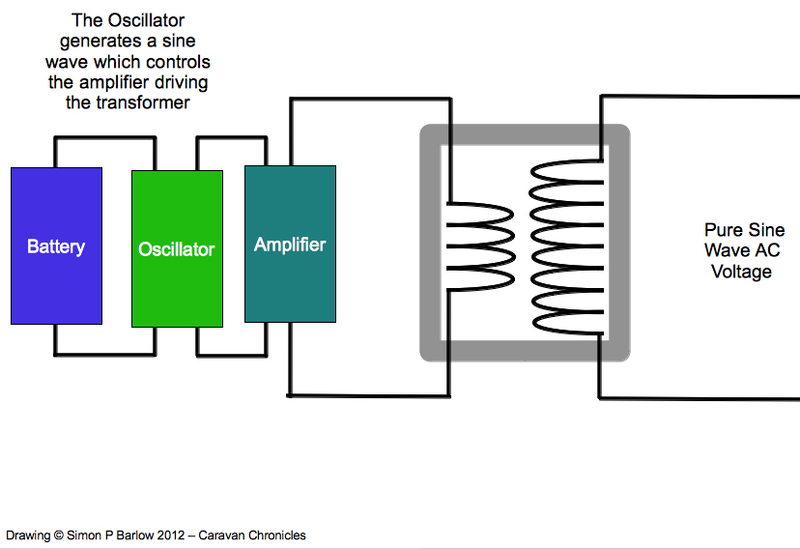 Some of the components used in the amplifier are expensive and the technology used is quite complex. If you are looking to buy an inverter, always try to buy a Pure Sine Wave model, they tend to be more efficient and should not cause any damage to sensitive electronic equipment plugged into them like TV’s and Laptops. Some equipment will not work on modified sine wave inverters – a lot of microwave cookers don’t work properly. Just a quick word about efficiency. No inverter is 100% efficient, at best they come close to 92% at worst, they can drop to 50 or 60%. An inverter needs power to operate, so expect to lose around 10 to 20 watts of power from your batteries just having the thing connected and turned on. Once it is operating, this well may increase especially if it has to run the internal fan to keep cool. As you go up the price bracket though, some inverters have a “sleep” mode and will reduce their own consumption to a few milliamps until power is required. Any device that has an inductive load, something with a motor, will always be less efficient running through an inverter than plugged straight into the mains electrical supply.. it’s all to do with power factors where the voltage and current become slightly out of phase with each other… but you can forget that… it sounds a bit too much like Star Trek! When choosing an inverter, always go for a slightly higher output (watts) than you think you need. It is better to have a 1000 watt inverter running at 700 watts than a 700 watt inverter running flat-out! As a rule, assume your inverter is only 80% efficient and work from there. In Part 2 I have included a table that will help you choose an inverter and work out the current draw from your battery. If you want to use an inverter using two batteries to provide extended run time, read my “How To: Connect Two Batteries in Parallel” as there is a right way and a wrong way. If the output of the inverter (wattage) is more than the wattage of the items you want to run, then the simple answer is yes. However, the TV will possibly have black lines or bands running down the screen. Anything with an electric motor should run, although it depends on the type of motor, some will run but not smoothly and others will not start. Motors running on square wave will tend to take more power than when running on sine wave and therefore run hotter. PS.. I’ve just tried to find something on a ‘shaving machine’ and I guess you mean hair clippers or hair trimmers. Most of these use a vibrating coil to drive the blade from side to side and I no experience of them running on an inverter. We do not have an inverter because I have been wondering what size battery pack I would need. Say my wife were to use a 240 volt 1500 watt hair dryer for 5 minutes and say the inverter has an efficiency of 85%. This would mean that the current to drive the inverter would be about 140 amps on the 12 volt battery side. If running this for 5 minutes this would amount to about 12 amp hr’s from the battery, if using a 110 amp hr battery we would still be above the 50% minimum charge level of the battery and would not cause any battery damage in terms of discharge levels. But would taking a high current of 140 amps cause damage ? would the battery suffer ? Do you know of a battery pack sizing rule of thumb when using an inverter ? I have seen a few points on the Road Pro web page which suggests I think that the battery pack should be 1/5 of the inverter power level. 140 Amps is a lot of current and you will need to use quite heavy cable, keep the cables as short as possible and personally I’d be looking at using matched pair of 12 volt batteries in parallel. There might be an alternative way of doing it. Commercial vehicles use two 12 volt batteries, but connected in series to give 24 volts. At 24 volts, you would halve your current draw to 70 amps and inverters are available for 24 volt systems and are ever so slightly more efficient. It would also mean slightly thinner cables and a slightly less voltage drop on those cables. It would also mean you reduce the risk of damaging the batteries through over discharging. I think though, it might be worth seeing if you can get your wife to use a lower power hairdryer…. it will be cheaper! I timed my wife’s “five minutes” of hairdryer use…. and it was actually eleven minutes, so that’s something to factor in too! PS… some ladies use gas powered heated hair brushes…. just a thought. Hi thanks for getting back to me I think the gas powered option is the way to go I Google this to see what is out there. Will try and get the wife to have her hair cut short also this would help ! To tell you the truth, I did not actually know how an inverter worked untill I read your article today. Some of our lorry drivers have asked me questions about which one to buy and how much power do they use. As you know most cab sleeper lorries have a 20 Amp 24 to 12 volt reducer factory fitted as standard, so this means a 12 or 24 volt inverter can be used. Firstly, for optimum efficiency (the least power consumption from the lorry batteries) I have advised them to buy 24 volt inverters. Secondly, I have explained to them that if they buy a 12 volt inverter, efficiency will be lost as this would be the case; 24v would be reduced to 12v within the lorry, then the inverter would take the 12v supply up to 240 volt, so by going streight from 24v to 240 volt in one go would be most optimum. Would you agree with these consumption figures? 12 volt inverter, draws around 1 Amp per every 10 watts of mains power drawn. 24 volt inverter, draws around 0.5 Amp per every 10 watts of mains power drawn. The easiest way is to work everything in Power (Watts). So, if you had a 240 volt device that was 200 watts, you need 200 watts from the battery (lets assume 100% efficiency for the moment) So 200 Watts at 12 volts is (P/V = I) 200/12 = 16.67 Amps…. for lorry 24 volt electrics, 200/24 = 8.34 Amps. We can see that at 24 volts, the current is half, therefore smaller cable can be used to connect the inverter to the battery supply, plus there will be less voltage drop in the low voltage cable. The efficiency of a 24 volt to 240 volt inverter tends to be better as its a 1:10 step up, where a 12 volt to 240 volt is a 1:20 step up so generally the 24 volt ones are better. A side benefit is you are only taking half the current from the battery(s) at 24 volts, so a 100 Ah 24 volt battery will last longer than a 12 volt 100 Ah battery. For a ‘rule of thumb’ calculation, assume you need 20% more on the low voltage side, so if you need 200 Watts at 240 volts, work on 240 watts needed on the low voltage side. PS – yes your right, the 24 to 12 volt step down systems are not very efficient and really are designed for low power devices… charging mobile phones, running radios, sat navs etc. I’d always go for a 24 volt inverter in your example. I use inverters on camera lighting rigs and all the battery packs for the inverters are 48 volts. Is it possible that the normal 2 plate stove can work properly to the inverters? It is unlikely that an inverter would be suitable for running a 2 plate stove. 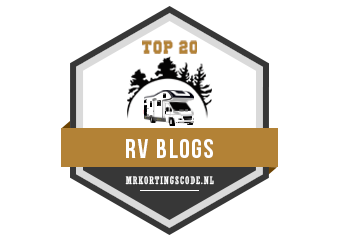 If you find the wattage of the stove and look at the table on this page https://caravanchronicles.com/guides/understanding-inverters-pt-2-buying-guide/ you can find the size inverter you would need. I think you would need a bank of battery’s to run the stove long enough to be useful. I suggest would suggest a propane gas type stove will be cheaper and more efficient. Just wanted to say thanks for a great article (inverters). I’m wanting to use one for lighting my garage (no mains elec. ), so your article has been very worthwhile reading because it explains how and why the things work. It makes me realise that in the long run it would be worthwhile buying one of the more expensive, higher rated models so it will be suitable for use in a van or on a boat when I (eventually) go away. Much appreciated. We have a 350w modified wave inverter which is not good enough to power the toaster. If you do the toast under the oven grill it seems to take forever and also dry out the toast too much plus you use a lot gas than is necessary. Is there a way around this as the other half likes her toast for breakfast? Not been asked about toast before! A domestic toaster is usually in the 2000 watt range, however Sainsbury’s Value Range do a toaster that is 750 Watts, we paid I think £4.99 for it a couple of years ago and it’s been great. Now a 350 Watt inverter isn’t realistically going to run much so I’d consider upgrading to a 1000 watt inverter which will be able to run the toaster… and also a set of hair straighteners which may seal the deal for your your other half! Unfortunately the only way I can see it upgrading your inverter. PS.. Maplins do this one: http://www.maplin.co.uk/p/maplin-12v-pure-sinewave-1000w-inverter-a34jy for £129.99 it’s a pure sine wave and realistically I’d always recommend a pure sine wave. It should run a 750 watt toaster without any problems. Don’t forget though it will need to be wired in correctly as it will draw 83 amps at 1000 watts. With LiFePO4 Batteries on the market and the price to kwh rating getting reasonable, I thought would it be more efficient to built a 110 or 220 volt battery and then create an “inverter” to just oscillate the current coming out of it? No need to step up or down the current, just oscillate (and amplify?)? Is there any device like this already in existence? Thank you! A side question, if the battery bank were 10 12v batteries, could it have two outputs, one being 120 volts, and the other wired with diodes to use the batteries in parallel with one another at the same time? LiPo batteries would seem like the way forward, however there are drawbacks. LiPo have very specific discharge and charge characteristics and recharging a large bank is not as straightforward as recharging a similar sized bank of lead acid batteries. If you look at modern electric vehicles the biggest cost is the batteries, the second biggest cost is the electronics to manage the discharge and recharging of the batteries. each set of cells is monitored for voltage and temperature during discharge and charging cycles. The second part of of you question – could you connect batteries in series and parallel at the same time using components is easier to answer… No, it’s not possible. I designed an electrical system for a friend who restored a classic 1952 Morane-Saulnier MS.317 aircraft. The main electrics are 12 volt, but the two batteries switch from parallel to series to give 24 volts when the engine starter button is depressed. That’s about as close as you would get. The usual rule of thumb when it comes to microwave units and inverters is rate the inverter at twice the power of the microwave, so in your case I’d be looking at a an inverter with a minimum of a constant output of 2000 watts with a peak of 2500 watts. Microwave take a huge inrush current initially to start up which usually trip out smaller inverters with an overload. Assuming the inverter is 100% efficient, then 800 watts at 12 volts is 66 amps… you would be pulling 66 amps out of your batteries for 5 minutes cooking with the microwave. Running a TV is less of a problem at 50 watts, but you will also incur losses through an inverter. A 12 volt TV would be a better solution if you can go for it. Can an inverter be connected in circuit at the same time as the 240v or does it have to be one or the other. I was thinking of back feeding to the 240v circuit by putting the output of the inverter directly into the ring main of a motor home circuit. I suppose what I am asking is does an inverter work both primary to secondary and visa versa. Its priced around £400 (ex VAT) and would do the job. If you need more power then there is a 2500 watt version available. A word of caution though. If you do connect it to the normal 240 volt mains system it could be very easy to overload by forgetting that you are running on an inverter (yes it does happen) so the convention is to connect only the specific outlets (sockets) to the output of the inverter so that when the inverter is running the sockets are switched from the normal incoming mains supply to the inverter output ensuring that you only power the required equipment from the inverter. Awesome post! I will admit that a lot of what you said went over my head and I will have to reread it, but it is nice to know how my inverter works. I also appreciate the heads up about getting one that puts out more wattage than I need. I certainly don’t want to kill my inverter before I have gotten a lot of use out of it. I assume you are talking about a domestic fridge installed in a caravan as most fridges designed for caravans are designed to run off gas, 12 volts DC and domestic power (120 or 230 volts AC). You need to check the manufactures plate on the fridge that shows voltage rating and power rating in watts. What ever the power rating is (watts) add 50% and this should be the minimum size inverter to specify. So if the fridge power rating is 200 watts, the minimum inverter would be 300 watts. Also check to make sure the inverter output voltage matches the input voltage of the fridge. Remember you can now work out the size of cable you will need from the battery to the inverter. So in our example of a 300 watt inverter, 300 watts divided by 12 volts = 25 amps… so you would need to size the cables so that they could carry a 25 amp current. What happens if I connect a 500w kettle to a 150w inverter? Will it boil slowly or blow a fuse? If it is a good quality inverter it will shut down… if it’s a cheap far east version it will probably fail and become a paperweight.